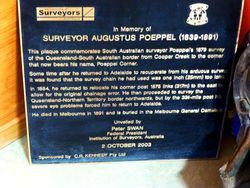 A plaque commemorates surveyor Augustus Poeppel who surveyed the Queensland-South Australian Border along the 26th Parallel of Latitude in 1879 to the corner that now bears his name. 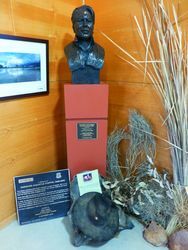 The plaque was sponsored by C. R. Kennedy Pty. Ltd.
Poeppel the South Australian Government Surveyor, marked the corner with a coolibah Eucalyptus microtheca post, 2.1 metres long by 0.25 metres in diameter. The post was dragged 58 miles (92 kilometres) westward from the Mulligan River. Poeppel adzed it on three sides and chiselled into it the words ‘South Australia, Northern Territory and Queensland’. Below the ‘South Australia’ inscription he carved LAT 26 LONG 138 for the latitude and longitude. The post was placed by Poeppel to complete his survey of the South Australian/Queensland border along the 26th Parallel of Latitude between the 141st Meridian to the 138th Meridian of Longitude, a distance of 186 miles 49 chains (300.3 km). It represented the intersection of the 26th Parallel with the 138th. Unfortunately his initial work was at fault due to his `chain` being one inch too long and was redone in 1884. 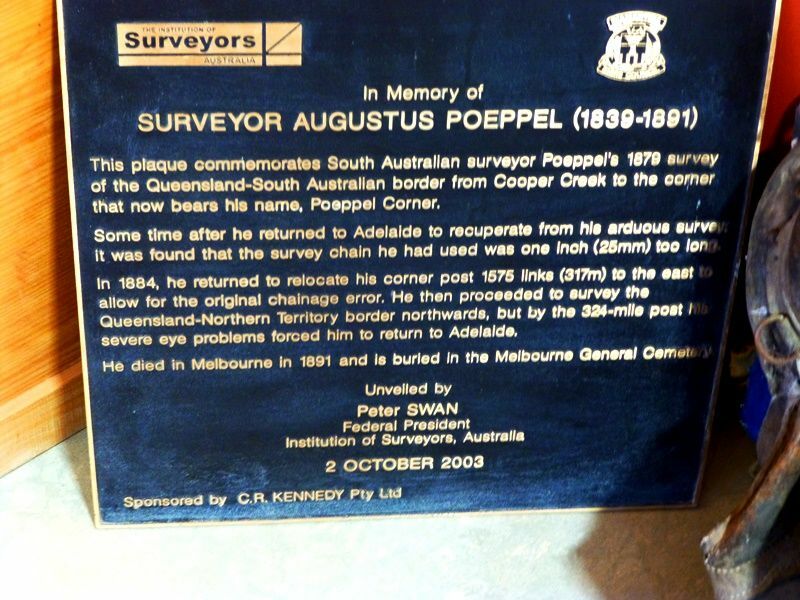 This plaque commemorates South Australian surveyor Poeppel`s 1879 survey of the Queensland-South Australian border from Cooper Creek to the corner which now bears his name, Poeppel Corner. Some time after he returned to Adelaide to recuperate from his arduous survey, it was found that the survey chain he had used was one inch (25mm) too long. In 1884, he returned to relocate his corner post 1575 links (317m) to the east to allow for the original chainage error, He then proceeded to survey the Queensland-Northern Territory border northwards, but by the 324-mile post his severe eye problems forced him to return to Adelaide. He died in Melbourne in 1891 and is buried in the Melbourne General Cemetery. Sponsored by C.R. KENNEDY Pty.Ltd.